Everyday Trays - Set of 3 (TUCEVERYDAY) at Pure Design / Accessories / Organize ::: Furniture for the Home, Office, Home Office, and More at Pure Design Online! Versatile and made right there on the shores of the San francisco Bay, Everyday Trays are good for any room in the home! 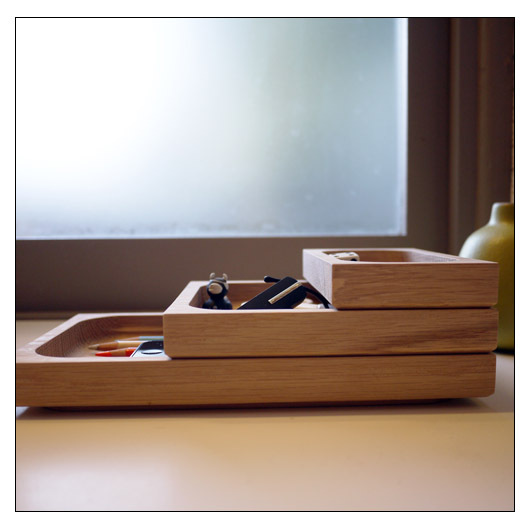 Finished by hand with a food-safe oil, this set of three beautifully sculpted trays have graceful bases that are perfect for stashing desktop items, or anything you can think of. They stack perfectly, too! Large Tray: 9" x 5.25" x 1" Medium Tray: 6" x 5.25" x 1" Small Tray: 3" x 5.25" x 1"
Please allow 3 days to ship.